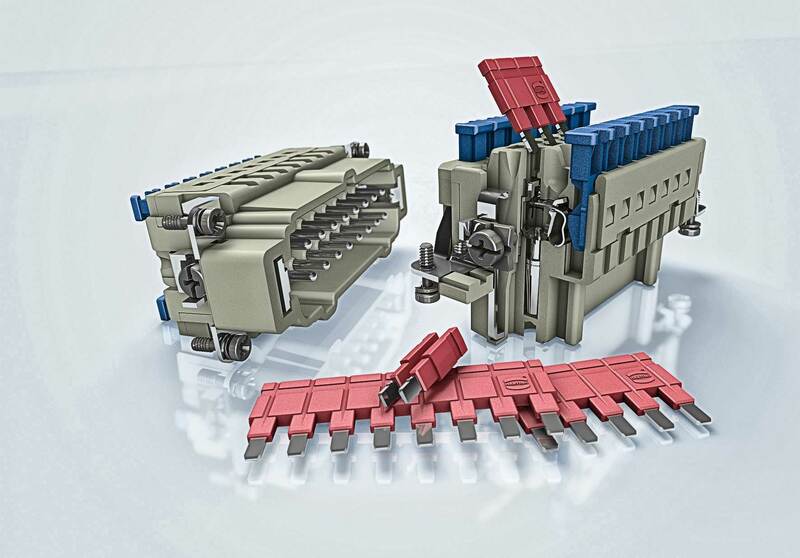 The tool-less rapid termination technology of the Han® ES Press is based on the proven cage clamp, and is consequently reliable and vibration-proof. Profit from faster termination times during series production wiring while still retaining the full functionality in field installation. No matter whether you use stranded wires with or without ferrules - you will reduce the installation time by up to 50% compared to other termination technologies! In the past, additional components or complex cable assemblies were needed to bridge contacts, but now, for the first time, the jumpers can be used directly on the insulation body. Various longitudinal and transverse bridges ensure reductions in space and time and also allow star and delta circuits in addition to potential multiplication, e.g., to connect sensors. The Han® ES Press features a compact design and construction that makes circuit troubleshooting child's play. The measurement point that is integrated into the opening of the plug-in jumpers is easy to access when the connector is mounted and allows measurements of the operating states. Wiring errors and defective components can be found more quickly. The same mating faces and technical characteristics make the Han® ES Press compatible with the proven HARTING products that are setting the standard around the world: Han E®, Han® ES and Han® ESS series. The HARTING Han® ES Press is available in the models 6, 10, 16 and 24 for the housing sizes Han® 6 B, 10 B, 16 B and 24 B.